You may not live on the Red Carpet, but you can still have trendy home carpeting worthy of celebrity status. 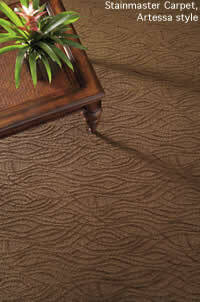 Today's carpet styles go beyond conventional, offering myriad choices to reflect your personality. From sophisticated and practical to unique and innovative, carpeting technology and trends have introduced new textures, colors and patterns that can be tailored to suit your style – and lifestyle. Gone are the days of limited color palettes. Today's kaleidoscope of carpet hues allow homeowners to deploy carpeting as a subtle complement to furniture and home décor, or as the focal point of the room. "There are some really neat bold patterns and colors out there now – aqua, chocolate and lights with darks that create drama and contrast," Jana Seda, from Interior Surfaces Inc. explains. More subtle color trends include soft, low luster shades, such as mossy and sea foam greens, rich gold, and beige with a hint of rose. Don't overlook the basics as boring. Neutrals will always be in demand, and recent beiges and whites sprinkled with flecks of color can enhance depth and mask spots and spills. While there is no "wrong" color choice, carpet experts note that strategy is key in the decision-making process. "Using the same color throughout the house tends to expand the perception of size and flow of a house," Dale Hanson, of Florcraft notes. You should also take into consideration the likelihood of selling your home in the future. Choosing unconventional color schemes can deter some buyers from considering your home. "If there is a chance of selling the property soon, light to medium beige is the ticket," Hanson recommends. No, we don't recommend lining your home with Astroturf (particularly tempting if you have pets) – but we do suggest that you take advantage of environmentally friendly carpeting products. Not only has the "green phenomenon" infiltrated the home décor market, but technological advances make it easier than ever to choose environmentally friendly carpeting. Since there are no recycling plants in Alaska, the most practical way to "go green" is to purchase carpet with recycled content. These materials, says Hanson, include recycled carpet, corn-based "Sorona" fiber, and PET polyester made from recycled soda bottles. Wool is a long-time player in the environmentally friendly carpet world. "Wool has always been considered 'green' and the weaving machines used to produce wool carpets are capable of producing all of the patterns that the new graphic machines are producing," Hanson explains. Some designers tell us that carpet tiles (or carpet squares) are one of the greatest flooring inventions. For one, they offer design flexibility – and the possibilities are endless: You can lay them straight or angle them for a different pattern, or blend colors and styles to create unique, custom looks. 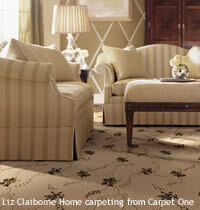 Use them in wall-to-wall carpeting, or to create carpet runners or an area rug in a room. "(Recent trends) are focusing on coordinating bold, patterned carpet in one area of the house that coordinates nicely with a solid," explains Seda of Interior Surfaces. Carpet tiles are also a family and pet-friendly choice. "If one spot were to be damaged, it's easy to remove one square without pulling up a bunch of carpet," Seda notes. Carpeting piles have also reached new heights: Longer piles, patterns created with varying pile heights, and alternating cut and loop piles are making a comeback. Customers like products that have new patterns and textures created by using different sizes of loops and heights of yarn, says Hanson of Florcraft. In fact, the revival has materialized in the form of a modernized shag carpet. "We might call them shags, but the products now are not as long, and with advances in nylon technology, will look better longer," Hanson explains. No matter what the era, clean carpets are always in style. To help, nylon manufacturers have made yarns that are more durable and stain-resistant and easier to maintain. Many homeowners have turned to carpets that have StainMaster fibers, designed to be resistant to stains and soiling. New textures and colors also help to mask imperfections. "Hard surfaces like wood, laminates and ceramic are gaining in popularity, but carpet is still the most forgiving and economical floor covering available," says Seda. While the trends on the horizon are vast, don't worry about whether a carpeting style that you like is about to be "out," recommends Seda, with backing from other carpeting experts. "Never avoid something just because it's in or out. Design with things you love."